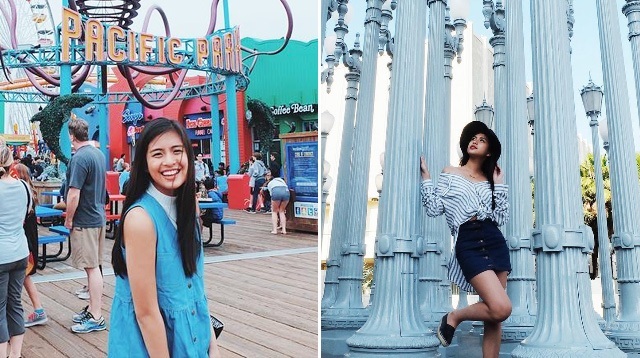 Gabbi Garcia and her fam recently visited Los Angeles, California, and we're suffering from serious travel envy! But instead of letting it eat us up, we channeled it into something helpful and made a guide to the must-sees and to-dos when in LA. Here are eight of them according to Gabbi's Instagram posts. Make your Tumblr dreams come true and take a pic—or better yet, ride the iconic Ferris wheel in this oceanfront amusement park! Ride the famous Santa Monica Pier Carousel, go fishing, enjoy the view—there are a ton of things you can do at this place especially since it's always open! Don't forget to try Zoltar, a fortune telling machine, just like Gabbi did! Whether it's the palm trees or the walls, there are so many great OOTD spots for you to choose from. Relive scenes from La La Land or get a spectacular view of LA's beauty—the hike is worth it! It's not exactly exclusive to LA, but you can't go to the States without ordering burgers and fries from In-N-Out. Heck, make it your first order of business when you arrive!